Give your homebrewed amp a facelift with a new faceplate! We have two in-house engraving machines that allows just about anything to be engraved into laminate plastic materials, The engraving bed size is 600mm x 400mm allowing most faceplates, control panel and logo’s to be easily made. 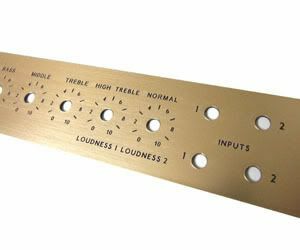 We can also provide design work for faceplates, just let us know what controls you have, the hole spacing and overall panel size and we can draw up a faceplate to suit your amp. Price for a standard tupe front engraved plate £20.00, providing you supply us with a complete and compatible design file. send your information by e-mail and we will take it from there. We keep the following colour combinations in stock. Other non stocked colours available on special request. We stock standard 1.5mm thick material. 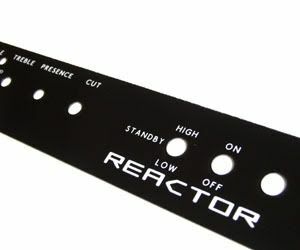 If you have a basic idea as to what you want we are able to draw up a faceplate design to meet your needs, The a fixed cost of £10.00 will be added to the cost of manufactuing the faceplate. Designs will be submitted in PDF format for approval proir to any engraving. Please note there is no design charge for simple changes to our standard faceplates. We utilise both AutoCAD and CorelDraw x4. Older versions of both these software packages are available cheaply online and can also be used for detailed chassis and layout drawings. Any non-Standard fonts must be supplied with the file. There are various free font websites available and there are often free alternatives to costly fonts i.e. “London Tube” is a free version similar to “London Underground” as used by Marshall. 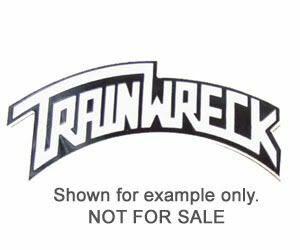 We wont make any logo’s or faceplates that are currently registered trademarks of any 3rd party company. All work carried out is done under the acceptance that the purchaser has the right to use the artwork. *Note: Due to the nature of colour on the web, colours above are only representations and should not be considered 100%accurate.